By Kiran Daware Kiran is a guest author for Peak Demand’s Knowledge Center and editor of Electrical Easy found at electricaleasy.com. Copper was the preferred material for overhead conductors in earlier days, but, aluminum has replaced copper because of the much lower cost and lighter weight of the aluminum conductor compared with a copper conductor of the same resistance. Following are some materials that are good conductors. Copper: Copper has a high conductivity and greater tensile strength. So, copper in hard drawn stranded form is a great option for overhead lines. Copper has a high current density which means more current carrying capacity per unit cross-sectional area. Therefore, copper conductors have relatively smaller cross-sectional area. Also, copper is durable and has high scrap value. However, due to its higher cost and non-availability, copper is rarely used for overhead power lines. Aluminum: Aluminum has about 60% of the conductivity of copper; that means, for the same resistance, the diameter of an aluminum conductor is about 1.26 times than that of a copper conductor. However, an aluminum conductor has almost half the weight of an equivalent copper conductor. Also, tensile strength of aluminum is less than that of copper. Considering combined factors of cost, conductivity, tensile strength, weight etc., aluminum has an edge over copper. Therefore, aluminum is being widely used for overhead conductors. Cadmium-copper: Cadmium-copper alloys contain approximately 98 to 99% of copper and up to 1.5% of cadmium. Addition of about 1% of cadmium to copper increases the tensile strength by up to 50% and the conductivity is reduced only by about 15%. Therefore, cadmium-copper conductors can be useful for exceptionally long spans. However, due to high cost of cadmium, such conductors may be uneconomical in many cases. Other materials: There are many other metals and alloys that conduct electricity. Silver is more conductive than copper, but due to its high cost, it is not practical in most of the cases. Galvanized steel may also be used as a conductor. Although steel has very high tensile strength, steel conductors are not suitable for transmitting power efficiently due to the poor conductivity and high resistance of steel. High strength alloys such as phosphor-bronze may also be used sometimes at extreme conditions. As it is already mentioned above, aluminum conductors have an edge over copper conductors considering combined factors of cost, conductivity, tensile strength, weight etc. Aluminum conductors have completely replaced copper conductors in overhead power lines because of their lower cost and lower weight. Though an aluminum conductor has larger diameter than that of a copper conductor of same resistance, this is an advantage when ‘Corona’ is taken into consideration. Corona reduces considerably with increase in the conductor diameter. Following are four common types of overhead conductors that are used for overhead transmission and distribution to carry generated power from generating stations to the end users. Generally, all types of conductors are in stranded form in order to increase the flexibility. Solid wires, except for very small cross sectional area, are very difficult to handle and, also, they tend to crystallize at the point of support because of swinging in winds. This type is sometimes also referred as ASC (Aluminum Stranded Conductor). It is made up of strands of EC grade or Electrical Conductor grade aluminum. AAC conductor has conductivity about 61% IACS (International Annealed Copper Standard). Despite having a good conductivity, because of its relatively poor strength, AAC has limited use in transmission and rural distribution lines. However, AAC can be seen in urban areas for distribution where spans are usually short but higher conductivity is required. These conductors are made from aluminum alloy 6201 which is a high strength Aluminum-Magnesium-Silicon alloy. This alloy conductor offers good electrical conductivity (about 52.5% IACS) with better mechanical strength. Because of AAAC’s lighter weight as compared to ACSR of equal strength and current capacity, AAAC may be used for distribution purposes. However, it is not usually preferred for transmission. Also, AAAC conductors can be employed in coastal areas because of their excellent corrosion resistance. 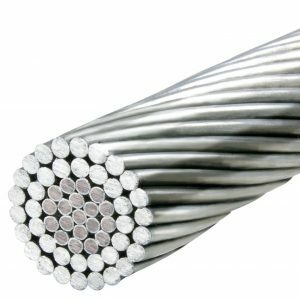 ACSR consists of a solid or stranded steel core with one or more layers of high purity aluminum (aluminum 1350) wires wrapped in spiral. The core wires may be zinc coated (galvanized) steel or aluminum coated (aluminized) steel. Galvanization or aluminization coatings are thin and are applied to protect the steel from corrosion. The central steel core provides additional mechanical strength and, hence, sag is significantly less than all other aluminum conductors. ACSR conductors are available in a wide range of steel content – from 6% to 40%. ACSR with higher steel content is selected where higher mechanical strength is required, such as river crossing. ASCR conductors are very widely used for all transmission and distribution purposes. ACAR conductor is formed by wrapping strands of high purity aluminum (aluminum 1350) on high strength Aluminum-Magnesium-Silicon alloy (6201 aluminum alloy) core. ACAR has better electrical as well as mechanical properties than equivalent ACSR conductors. ACAR conductors may be used in overhead transmission as well as distribution lines. © Peak Demand Inc. All Rights Reserved.